So How Did I Quit The Cubicle For The Road? It’s been over a year now since I bade a very heart-wrenching goodbye to my cubicle. Quitting the 9-5 job and switching to freelancing was not on my mind at that time (not that I loved what I was doing). Although I was a professional writer, I never really got my due. I always felt suffocated and miserable. Until last year, I was giving my blog only the leftover time. I used to stay up late to do what I really wanted to do, and I had to rush in the morning to a place that I hated. I think I just got too lucky fortunate to have come to a point where I was left with no option but to follow my dream. I was kicked out to do what I enjoyed doing the most. My heart wants to say a million thanks to the nasty manager I got in Mumbai. Yes, the revelation happened when I moved to Mumbai. The job I was doing in Delhi sucked. Actually, not the job but everything about the office, the system and the management sucked. So, it just happened that when I got a new job in Mumbai, I took it as an opportunity to escape what I was doing in Delhi. However, somewhere deep down in my heart, I knew that what I had taken up was not going to last. I knew that I didn’t want to do even what I had accepted in Mumbai. But, I was still happy, because I wanted to take this ‘new change’ like a traveller. Mumbai has always been my favourite city, so when I got a chance to live there as a local, I couldn’t let it go. Even though I landed in a much worse place in Mumbai, it was a change in my life, which I really needed at that point of time. So yes, I was unhappy, but still happy. The day I joined that new office in Mumbai I started looking for new jobs. It was a point in my life when I couldn’t think of quitting even if I didn’t like what I was doing. Thus, I tried my level best to find a work that would please me and also pay me well. My family was moving to Hyderabad at the same time. So, it was a wrong time to tell my people at home that I wanted to quit. I just couldn’t do it. I had to stand by them and besides, I too wanted to earn well to fulfil my own personal goals. But, God (I wouldn’t like to use the word destiny) had some other plans for me. While I was madly, diligently and ferociously hunting for a new job in Mumbai, He was secretly devising something else for me. I had already lost the job that I was doing. It was a foregone conclusion of what had been happening at that crappy workplace. I wasn’t surprised. But, I couldn’t deny the fact that I needed work. So the hunt continued for a while. Even though I was in terrible pain, I enjoyed my sojourn in Mumbai.Just after I lost my job, I took a solo expedition to Matheran, a hill station near Mumbai. I was short on money, but full of enthusiasm. I didn’t let the sudden financial upheaval deter the ‘voyager’ in me. I also went to Pune with a friend. Then one fine day, everything changed. I went for an interview in South Mumbai near Churchgate station. While I was being interviewed, I had a slight fear in my heart – fear of getting the offer letter. Yes, I was scared to get the job. Although I performed well and did my best to convince the interviewer that I fit the bill completely, my heart had taken a new turn already. I was called again the following day for another round. Obviously, I was double-minded about it. But I still went for it anyway. I took my camera along, as I had also planned to explore South Mumbai that day. So, quickly after the interview, I set out on my jaunt. I remember the exact moment when I knew that I didn’t want to go for any more interviews – it was when I was at National Gallery Of Modern Art and I got a call from a job consultant. While talking to him, I was totally convinced in my heart that I didn’t want to do it, but I still assured him that I would show up for the interview. My heart was clear about what it really wanted, but my mind was still a slave to the usual ‘safe and secure’ life syndrome. 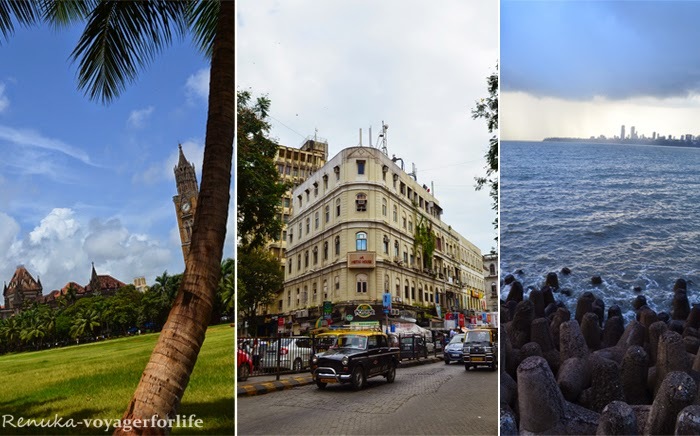 South Mumbai – Wandering the streets, clicking pictures, meeting random people…this is what I truly enjoy! After that particular call, my heart was overjoyed with its new found freedom. As I walked the streets of South Mumbai, I had a strong feeling that this was what I wanted. I loved my freedom. It was a fabulous day! I walked so much that day that I had painful feet at the end of it, but my heart rejoiced. As days passed by, my belief to switch to full time travel blogging and freelance writing got firmer. Finally, I left Mumbai and came to Hyderabad where my family and a new home were waiting for me. But the freelance writing thing didn’t happen so easily. I had to wait for months. In the meantime, I worked hard on my blog. And then gradually, I began to see some fruits on the tree that I had planted. I was invited to visit Dandeli (a place in North Karnataka) by Dandeli Official Travel Partners. It was a big pat on my back. Quite soon after that, I got my first freelance writing project also. Well, I wouldn’t say that all has been rosy since, but I am on my way to where I want to be. Did my story inspire you? Do you have any questions? Ask away in the comments section! Subscribe to receive ‘new post’ updates through Email. Become a fan on Voyager For Life Facebook page. It is thoroughly inspiring Renuka. 🙂 one more thing, even though u hated ur jobs, u gave your 100%. U were simply amazing as a colleague. Now when u have decided to pursue your dreams, I wish u success. May God plan the best travel itineraries for you so that we can read some of the most entertaining amd inspiring travelogues. 🙂 All the best! It takes inner strength to break free from convention and march to the beat of your own drummer. Congrats to you! The story touched heart all I can say. Keep traveling, keep writing. Best Wishes always. Wow, Really its too tough to get out from the things you are giving your 100% just for sustaining your day life. I'm very happy read that, how a day came in your life and you spread your wings and find out the way was actually waiting for you. Personally, The element you use to describe yours blog is full of enthusiasm and motivating. My best wishes are always with you. I am still the software engineer guy working with the MNC. I photo blog at http://www.anirbansaha.com . Someday I'll also break free. You inspired today. Thank you. Nothing like working at one's own pace, and getting paid for the work that you enjoy doing. That is incredibly inspiring. And it's pretty amazing you've been able to make your dreams come true. I actually do have a question about how you got your start freelancing. I've worked as a professional writer as well. It was brief, but I have been published. I'm currently trying to find freelance jobs, preferably in the travel field. Do you have any suggestions on where to start? For example, how and where did you first start pitching? I'm finding it difficult to find legitimate places to publish that will actually get me noticed. I realize this is a vague question but any information would be very much appreciated 🙂 You can always email me at thetravellush@gmail.com! Thanks Justine! You have always been so supportive. Yes, to get your first freelance writing project is difficult. There are websites like odesk, freelance and elance that offer a space to freelancers. If you want to you can register yourself on all these sites, and see what works out for you. All the best! Thank you so much, Anushakti! 🙂 You don't know how big a source of encouragement you are! God bless you. Thank you, Tushar! I'm glad to hear that. I hope more and more pursue their dreams. Thank you, Vinddan! 🙂 That's so nice of you! I think everybody has that strength to just take that first step towards their dreams. True, Franca! To make that decision is hard, and it took me months to finally be firm about it. Thanks! Welcome Anirban! I am so glad to have inspired! 🙂 I hope you too pursue your true dreams soon! All the best! Thanks Christine! 🙂 Yes, that feeling is quite strong when you know something is not for you. Oh! 🙂 Enjoy your job till you are meant to do it! Thanks Tim for your support! 🙂 It's people like you who make blogging so much more fun and inspiring! Very encouraging and Inspiring 'Voyager'. It feels good to see people listening to their heart. India is becoming more socially secured now. Thanks Varun 🙂 Yes, listening to your heart is important. When your heart says something to you and you have peace about it, go for it! Thank you Ashwini 🙂 Yes, taking that first step is difficult, yet important. Once you embark on the journey, things do turn in your favor. Hats off !!! you are a great inspiration to many GIRLS out there… and even to me ! Thank you for posting this and letting us know what it is to follow your dreams…the happiness you get then is ultimate !!! May god bless you with more, much more than you could ever dream of. Beautifully put! Yes, the happiness that we get after we take that first step towards our dreams is truly ultimate! 🙂 Thanks so much, Akriti! Congrats on moving away from the cubicle. I hope you are able to make things work in the freelance world. Thank you, Emily! 🙂 Yes, even though what doesn't sound normal or safe sometimes can be the right thing to do! Thanks Rahul 🙂 Nice to know that you could relate to my story! Thanks so much for sharing! Great article and an inspiring story Renuka. It has been a pleasure to follow you on this journey and to see the freedom and exhilaration this choice has given you. To read about your interviews is great since it means that you have choices and have set yourself in this position. Making money as a writer is not easier but you've worked really hard at this. Continue to inspire Renuka and here's wishing to your prolonged success. Thank you so much! It's been a great pleasure to associate with you and your website! Perhaps this is the best part of blogging that one gets to meet so many amazing people along the way! "… and are called according to His purpose." 🙂 The cubicle is obviously not where you were meant to be. It seems a shame that so many people allow fear to hold them prisoner in a job they detest. What a sad way to spend a life. Since you lost your source of steady income, have you ever gone hungry or homeless? I know I haven't. Quitting was the best thing I could have done. Thank you Linda! 🙂 Yes, all things God works for the good of those who love Him and are called according to His purpose. Yes, by God's abundant grace, I was never hungry or homeless. In fact, I moved into a new home in Hyderabad – it's our own house! I did go through a tough phase, but God was with me through it. Now I have come a long way…I am on my way! Thank you, Traveolani 🙂 Yes, I am glad too not just for myself, but for the fact that my freedom is an inspiration for many! Hi Renuka, liked ur post.. inspiring 🙂 do wat u luv n luv wat u do !!! I know u enjoy ur work 🙂 it shows from ur each n every post! enjoyed reading it! Thank you! You are one of the people who have played a big part in encouraging me to keep moving on! 🙂 Heartfelt post, Renuka. All the best. Quite inspiring renuka.I usual bow such people who has the guts to forget running behind a 9 to 5 job and instead focus on their dreams. Thanks Shilpa! 🙂 I am glad to hear that! I think all of us have that strength to follow our dreams somewhere inside us… we just need to push it! Thanks for sharing your story. It's not easy to step out of what seems secure, but you usually have to in order to get what you really want. I still struggle with this. True, Stephanie! It is difficult to step out, but once you take that first, the rest of the journey is pretty interesting. I wouldn't say things are all rosy for me, because I have to constantly look for new work, but I have freedom to be my own boss and polish my creativity. Hope you are able to do what you really want to do soon! All the best! Hello Renuka! I am incredibly inspired by your blog and your mission. I too would like to travel full time and blog about it. I am currently practicing law in California. Although I'm grateful for my career, my soul remains unfulfilled. I will be in India for a wedding next October and would love to meet you! Gr8 post Renuka 🙂 From the start till the end I had a cute 🙂 on my face as I can feel we are connected !! May be bcoz even I have given-up 4-5 years of Corporate Work and have started finding myself through my blog. Oh that would be great, Brittany! 🙂 I'd love to meet you too! I'm glad to know that you are inspired by my blog. All I can say is that doing what you are really passionate about is the best thing to do. That's wonderful, Pooja! 🙂 I'm glad to hear that! Yes, doing what you really like gives you total freedom and wings to fly high! Your heart knows what is the best for you and your beautiful post proves how important it is to listen to your own inner voice. It is only when i read your amazing blog stories, i feel the deep enthusiasm to write myself. May be someday it will happen and my reason for writing will be your inspiring stories and your adventurous tales of several cities. Thanks a ton! 🙂 Yeah, listening to your heart is so important, and to know if your heart is right you need to follow peace. There is an amazing peace that you feel once you do what you are supposed to do. Thanks Deepika! 🙂 I'm glad you are inspired. You are right, it takes courage and strong will to quit a secure life, but it's much more painful to remain stuck in the rut. As far as comments are concerned, I'd advise not to worry about it too much. Just focus on churning out good and valuable content consistently. Write for search engine and not for your fellow bloggers. That said, I wouldn't deny the truth that it feels terrible when you don't receive comments. If you like to see more comments on your posts (for encouragement and feel good factor), make it a point to comment on other blogs. But at the end of the day, what matters is what you write is inspiring, informative and interesting. All the best! I am a photographer and recently started to jot down my stories as a travel blog. Initially I am using free blog sites to see how it turns out. I am completely new to travel blogging although I travel a lot mostly in India. I am confused as to choose the right path towards better blogging. I am improving my writing skills. But I was more concerned how did you managed to get your first travel assignment, which you mentioned above ? How do you suggest I should do the perfect marketing of the blog or any suggestions on how did you do it? You can review my blog which is at a very novice stage but every big thing has a beginning right? as you had some day. Nice to know that you have started a blog! It's wonderful to write about your travel experiences and share them with the world. The simplest technique to making your blog a success is working hard at it. Yes, you will have to sow without expecting anything. Your motivation to write a blog should come out of your sheer love for writing and sharing. As long as you can write well, help people with your knowledge, experience and tips, your readers will grow. But, all of it doesn't happen as early as you might expect. You should also learn the art of patience. Learn to enjoy the process of growing a blog – it takes time. All the best! Thanks Sakshi 🙂 That's so kind of you! Starting a blog to be an independent writer is a great idea! All the best! I'm glad to hear that, Ramya. 🙂 All the best for travel blogging! Thanks for sharing this nice post ! Read like my story except I am not a successful blogger yet. Your story is inspiring and resonates totally with me. New to your blog and planning to gulp down as much as I can. Thank you so much! All the best for your blogging. Just keep at it. My comment got lost somewhere. Loved your story and it read just like mine. New to your blog, planning to gulp down as much as I can. Good Luck! Oh! That’s so very kind of you. 🙂 Please feel free to explore my blog. Thank you! How’s the freelancing going a few years later? To be honest, I’m not making great money with freelancing. But, there are so many other things that have emerged over the years, such as brand collaborations, which are far better paid. Love that you ‘love what you do’ not many people get a chance to do that, while the others are simply stuck between choosing between what is good and bad… keep up the good work. Wish you luck, joy and all the happiness that your work brings you. God bless. Thank you so much, Savio! Where do you freelance now? HI, it was Nice to read your blog , I could relate with this a lot , I too write but personally and in my desire to change this personal writing in professional ,found your blog , good work , keep it up. Thanks, Smriti 🙂 All the best to you for your writing!